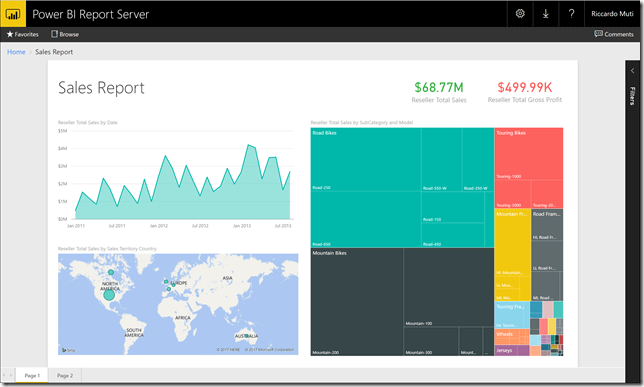 Power BI Report Server for on-premise deploy with Power BI Premium. Microsoft announced Power BI Premium – a capacity-based licensing model that increases flexibility for how users access, share and distribute content in Power BI. The new offering also introduces the ability to manage Power BI reports on-premises with the included Power BI Report Server. Power BI Report Server is an on-premises server that enables Power BI Pro users to publish Power BI reports and distribute them broadly across the enterprise, without requiring report consumers to be licensed individually per user. Organizations now have the flexibility to publish their Power BI reports to the cloud (Power BI service), or manage them on-premises (Power BI Report Server) and move to the cloud at their pace. Power BI Report Server is built on the proven SQL Server Reporting Services technology, and includes all Reporting Services capabilities, including operational (RDL) reports.Power BI Report Server will be generally available late in the second quarter of 2017. Power BI Premium allows customers to purchase Power BI capacity (virtual cores) in the cloud. It also includes the rights to concurrently deploy Power BI Report Server to the equivalent number of cores on-premises.